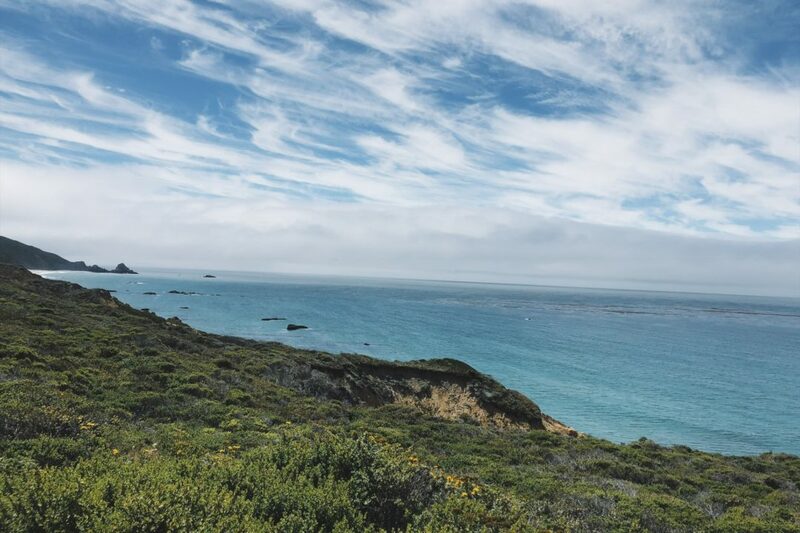 If you want a gorgeous ocean view for less than $50 a night, you are in luck. Encinitas’ San Elijo Campground has it all, access to beautiful beaches, great walkable areas to eat and drink and more but it also has the 101 vehicle and foot traffic and the roar of the train passing by at nearly all hours. So is it worth it? I’ll break down the pros and cons. In North County San Diego in Cardiff, California (part of Encinitas) there is a California State Park campground called San Elijo that features beach front camp sites. Many of the sites have full hook ups for RV’s. 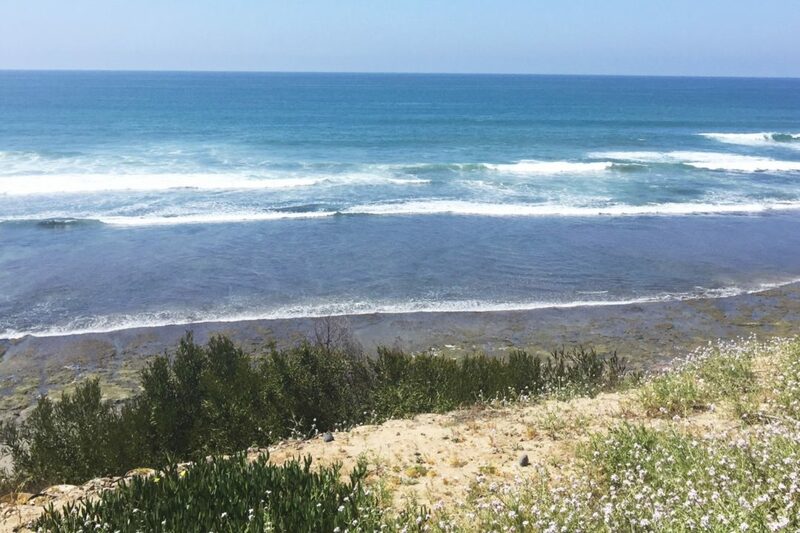 The San Elijo State Beach offers swimming, surfing, showers and picnicking and is extremely family-friendly. This campsite is also very popular and as soon as the sites are open for booking (usually six months before) weekends go fast! Go here to book your campsite. We have found that people do cancel so keep checking if your desired dates are booked and a site may open up. 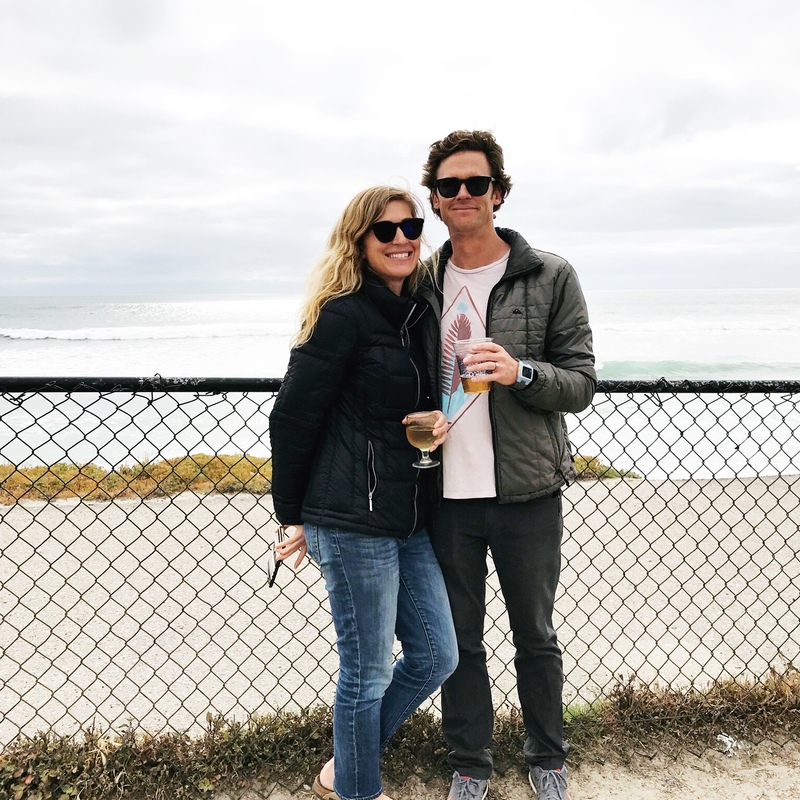 San Elijo is walking distance to some of Encinitas’ fantastic eating, drinking and shopping so your camping experience can be much more than just confined to your campsite. Let’s review some of the features of the campground, and I’ll give you a heads up on a few of the less desirable aspects. San Elijo Campground is in Cardiff, California the very south part of Encinitas before it becomes Solana Beach. Its right off the 101. 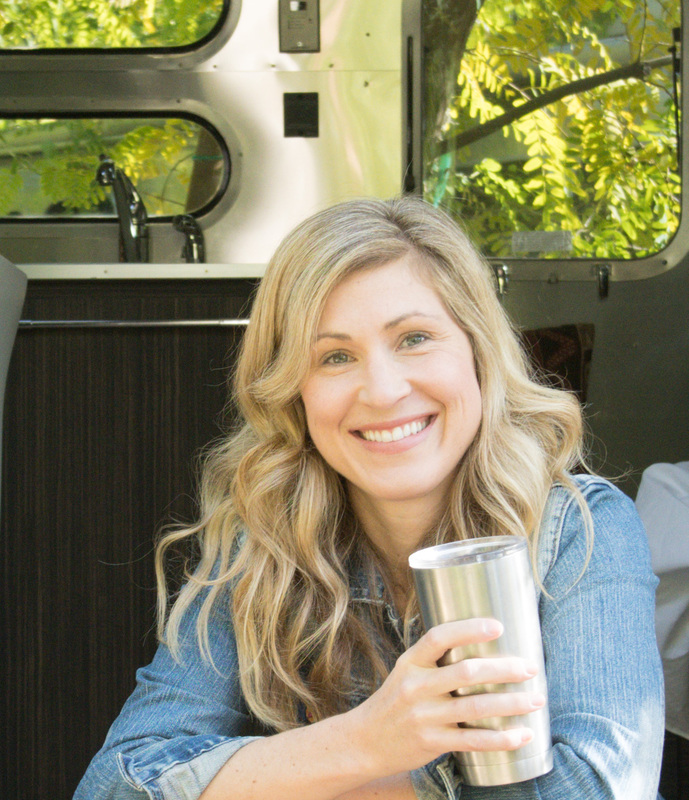 The campground offers sites for tent camping and hookups for RVs. If you don’t have your own RV there are companies that actually bring an RV in, set it up for you and will take it away. The ultimate glamping experience. I have friends who just did it flying in from out of state and they said it was a great experience. Here’s a company the delivers. A big part of the fun of camping is cooking the food outdoors but San Elijo is unique in that just across the street from the campground there is an abundance of restaurants and the amazing Seaside Market which has some the best marinated tri-tip around. Lovingly called “Cardiff Crack” the tri-tip is perfect camping food (especially if you pair it with their homemade horseradish sauce). But I digress, I’ll get into more about eating options below. A Cardiff staple since the 1960’s, VG’s (which stands for Very Good) is known throughout the county for its amazing donuts and other baked goods. Tip: bring cash – they only take credit for purchases over $10 dollars. My favorite are their maple bars. Mmmmm. If you can make a donut on your camp stove, you clearly deserve some kind of award. If you are human, its totally worthwhile to just run across the street (or heck be totally lazy and drive) and pick up one from the experts. Seaside Market is just a fun place to go whether you’re camping or not. 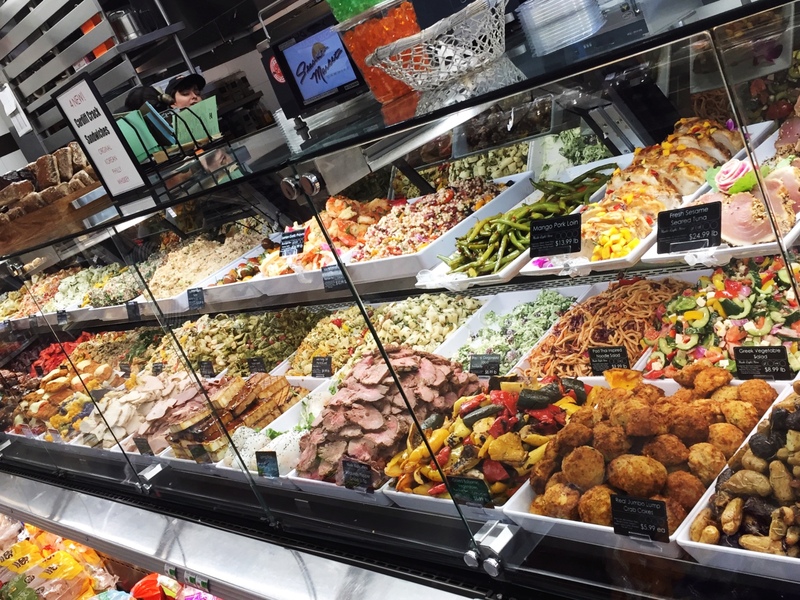 The Tri Tip, prepared foods, salads, cheeses, veggies and fruits, and seafood are all incredibly fresh and much of it grown locally. One night during our recent camping trip we shopped entirely for our dinner at Seaside and it was incredible and really space-saving since we didn’t have to pack as much food. Seaside also has some toiletries and other necessities if you forget paper towels or other goods. As an added bonus, they have weekly specials on all sort of items including flowers. I got a bouquet for 1.99$ that we used to brighten up our camp table. So go ahead, Glamp it up! Get yourself an amazing charcuterie board, or have them shuck some oysters and put them on ice for you. 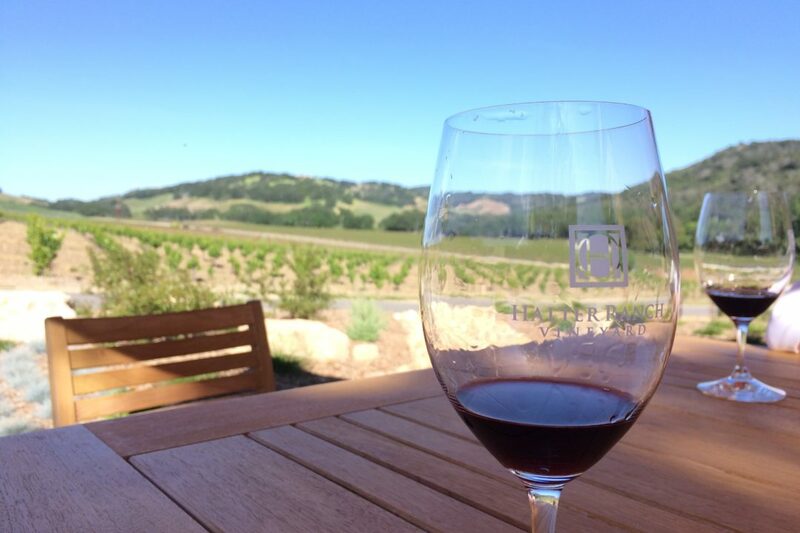 This Tasting room is a lot of fun and family friendly (and dog friendly on the patio). Lost Abbey Beers have a definite theme (Devotion, Gift of the Magi, Judgement Day) and at this location they have 23 beers on tap (both their own and other brewers), they also have bottles for sale. 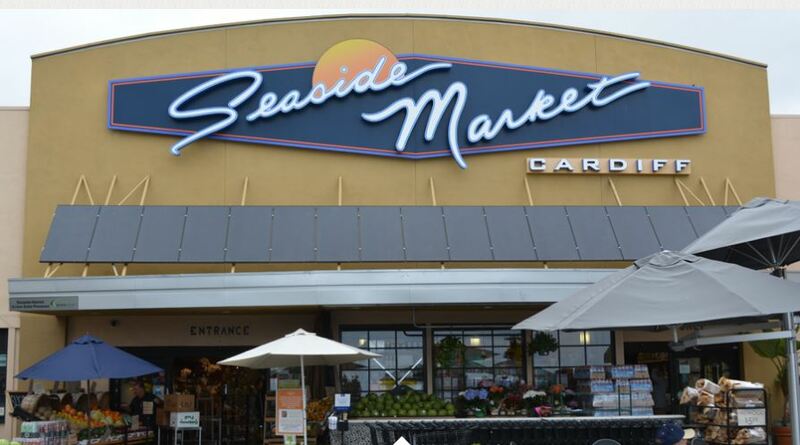 The location is in the same shopping center as Seaside market so go to Lost Abbey, enjoy a few tasters, and maybe fill up a growler or grab a six pack and then head over to Seaside and pick up dinner. Also, you can bring food into the tasting room, we brought our oysters and my friends enjoyed them along with some tasters of IPA. If deep fried tater tots along with your surf and turf burrito sound good (and they are!) this is your spot. 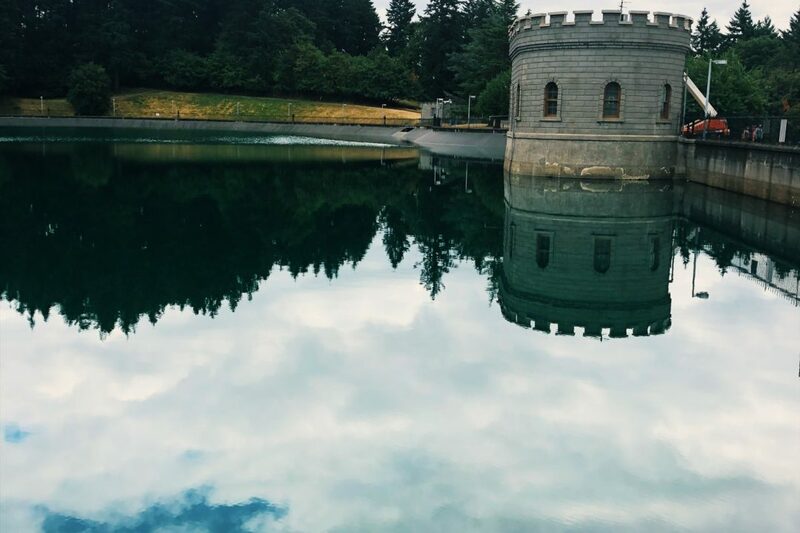 You don’t even have to leave the campground to visit this popular walk up spot its attached to the camp store. The tacos, burritos and other fare are fantastic, and paired with an incredible view of the ocean, it doesn’t get much better. Tip: its cash only – there is an ATM machine in the store that you can use. Surfing — there are some great surfing spots steps from the campground. Tidepools — at low tide you can walk way out and look around the reef tidepools. 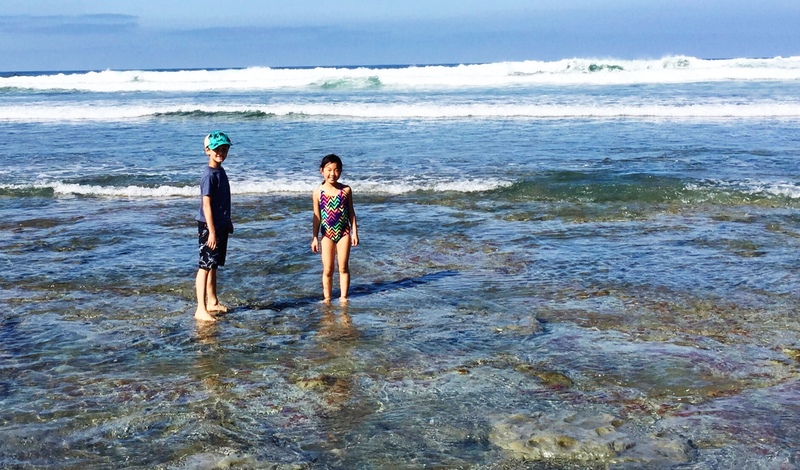 After a few hours of low tide, the tidepool water got really warm and my kids were loving hanging out in them like a bath tub. Dog friendly beach — If your pooch is on a leash you’re in luck! At the south end of the campground you can bring your dog at all hours. 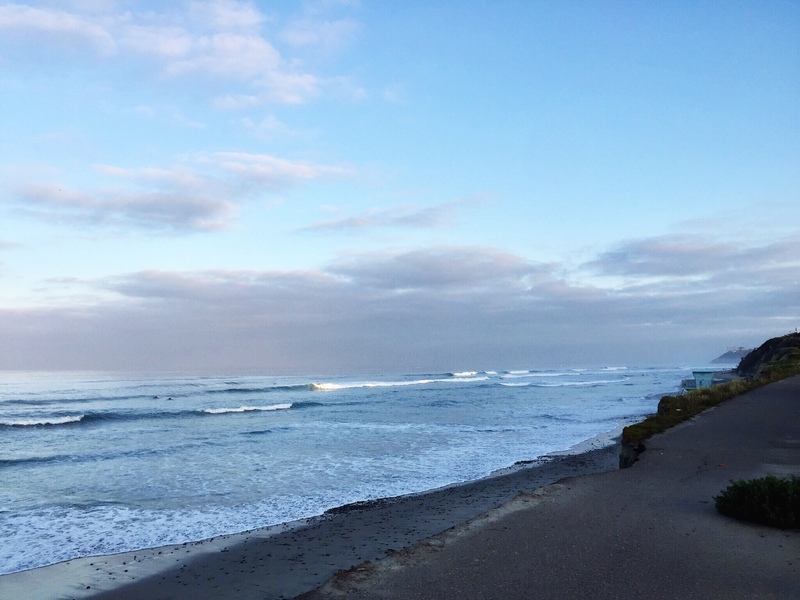 Walk or run on the beach from Cardiff all the way to…..You can walk in either direction – toward La Jolla or toward Carlsbad at low tide. The campsite is very, very close to the train that passes by several times a day and late into the night. For safety reasons the conductor blows the horn through the area and its LOUD. If you are tent camping definitely Bring earplugs. This is beach camping and its very different than camping in the woods. Expect very little in the way of trees – and there is little to no overhead shade so I recommend bringing an easy up shade to cover your table. Privacy is limited. The sites are close together, and the road — 101 is right next to the campground. If you are uncomfortable with people being within earshot, and able to see into your campsite this might not be the place for you. That being said, we have seen some people get creative with making privacy barriers. We haven’t found the lack of privacy to be that big of a deal, everyone that we have encountered has been courteous. The showers do cost money so get tokens from the camp store. There aren’t any soap dispensers in the bathrooms, so bring your own. The benefits far outweigh the drawbacks. 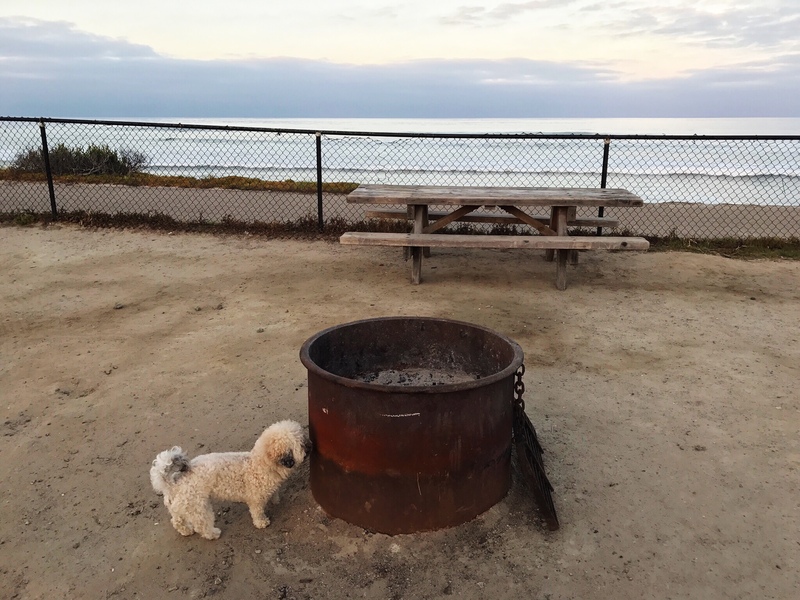 If you pack some earplugs, some cash, and perhaps get strategic about how you position your tent and cars for a little added privacy, Encinitas’ San Elijo Campground is definitely a fantastic place to camp, eat, drink, and soak in the best of North County San Diego.